1. DAVID DANIEL5 KIRKLEY (ROBERT4, ROBERT KIRKLEY3 SR., JAMES2 KIRKLEY, (SR.), JOHN1) was born 19 Jun 1873 in Sumter, Sumter County, South Carolina, and died 10 Dec 1946 in Ardmore, Oklahoma1. He married (1) NETTIE JANE BERRYHILL 21 Dec 1892 in Linnflat, Nacogdoches Co., Texas2, daughter of THOMAS BERRYHILL and LYDIA TRAWICK. She was born 18 Mar 1876 in Linnflat, Nacogdoches Co., Texas, and died 18 Nov 1893 in Linnflat, Nacogdoches Co., Texas. 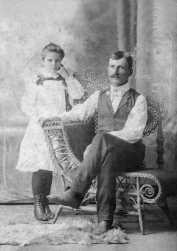 He married (2) ZENOBIA E. MILLS3 22 Aug 1895 in Nacogdoches County, Texas4, daughter of HILLARY MILLS and MARTHA RUSSELL. She was born Abt. 1861 in Texas5, and died Aft. 1930. He married (3) ELLA WELLS SMITH Aft. 19306, daughter of RUBIN WELLS and CATHERINE WILHITE. She was born 31 Jan 1884 in Dallas Co., Texas7, and died 24 Jan 1982 in Ardmore, Carter Co., Oklahoma7. David was a carpenter. And a Baptist. David and Zenobia were living in Ardmore, Oklahoma and enumerated there on 1930 Oklahoma Federal Census. On the 1930 Census he was a watchman for the Railroad. Wife, Zenobia, was abut 13 years older than David. Nettie Jane died just 12 days after the birth of her daughter, Nettie Ann Kirkley. She is buried in Linnflat Cemetery, Nacogdoches Co. Texas. From 1930 Carter County, Ardmore, Okla. Federal Census, Zenobia was married for first time at 35 years of age. Was her marriage to David Daniel Kirkley her first marriage??? Zenobia was abt 13 years older than husband, David. Married by Justice of the Peace #5, J. W. Murph. Has a daughter, Billie McMullen, who paid for her burial. 2. i. NETTIE ANN6 KIRKLEY, b. 06 Nov 1893, Linnflat, Texas; d. 08 Sep 1919, Linnflat, Nacogdoches Co., Texas. 2. NETTIE ANN6 KIRKLEY (DAVID DANIEL5, ROBERT4, ROBERT KIRKLEY3 SR., JAMES2 KIRKLEY, (SR.), JOHN1) was born 06 Nov 1893 in Linnflat, Texas, and died 08 Sep 1919 in Linnflat, Nacogdoches Co., Texas. 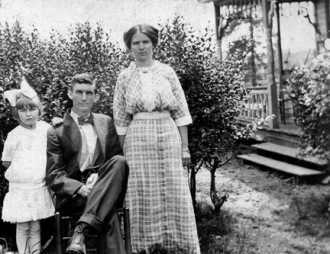 She married JULIAN HENRY SANDERS Jan 1914, son of JOHN SANDERS and MARTHA LOLLAR. 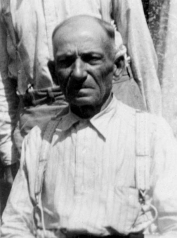 He was born 01 Nov 1889 in New Salem, Rusk County, Texas, and died 16 Jul 1957 in Big Lake, Reagan County, Texas8. There is an error in the birth date of Nettie Ann on her gravestone. It should be Nov. 6, 1893. The old stone in the Linnflat Cemetery has the correct date. Nettie Ann was also called Annie. She was living with the Berryhills, her maternal grandparents, at the time of the 1900 Federal Census. An Ancestry World Tree Project gives his death place as Big Lake, Reagan, Texas ; contact is unknown.' Ryan and Pam Walker wrote that he lived in San Angelo, Texas at time of his sister, Martha Emma Sanders' death in 1934. Was a carpenter and a farmer. Also lived in Enid, Oklahoma for 7 years before moving to Big Lake. 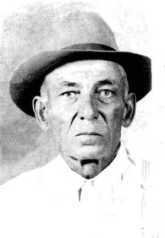 Julian was a proprietor of a restaurant in San Angelo, Texas and lived on Mesquite St. on 1930 Tom Green County Texas census with his three children. (2009) He was tall and slender with blue eyes and black hair on World War I Registration Card, dated June 5, 1917. 3. i. RUTH7 SANDERS, b. 09 Nov 1914, Nacogdoches, Texas; d. 02 Nov 1998, San Angelo, Texas. 4. ii. LESTER SANDERS, b. 22 Nov 1916, Nacogdoches, Texas; d. 12 Jul 1999, Livingston, Polk County, Texas. 5. iii. ANNE SANDERS, b. 08 Sep 1919, Nacogdoches County, Texas; d. 14 Jun 2003, Enid, Garfield County, Oklahoma. 3. RUTH7 SANDERS (NETTIE ANN6 KIRKLEY, DAVID DANIEL5, ROBERT4, ROBERT KIRKLEY3 SR., JAMES2 KIRKLEY, (SR.), JOHN1)9 was born 09 Nov 1914 in Nacogdoches, Texas, and died 02 Nov 1998 in San Angelo, Texas. She married (1) JOSEPH ERVIN WOOTEN9 24 Dec 1933 in Clovis, Curry County, New Mexico, son of JOSEPH WOOTEN and MATTIE JONES. He was born 26 Jun 1910 in Konawa, Seminole, Oklahoma, and died 31 Dec 1939 in Sanatorium, Tom Green County, Texas. She married (2) HENRY DAVID CHILDRESS9 09 Sep 1941 in Kerrville, Texas. He was born 07 Oct 1891 in Missouri, and died 24 May 1971 in Big Spring, Texas. The Wooten family had emigrated from Oklahoma to Veribest, near San Angelo, Texas. Information sent by e-mail to Kent Kirkley from Ryan Walker, son-in-law of Jo Ann Wooten Smith, July 6, 2008. .
6. i. JO ANN8 WOOTEN, b. 29 Dec 1934, Hale, Texas. ii. JOSEPH ERVIN WOOTEN, b. 19 Jul 1936, Hale, Texas10. 7. iii. JERALD ALLEN WOOTEN, b. 16 Mar 1938, Hale, Texas. 4. LESTER7 SANDERS (NETTIE ANN6 KIRKLEY, DAVID DANIEL5, ROBERT4, ROBERT KIRKLEY3 SR., JAMES2 KIRKLEY, (SR.), JOHN1) was born 22 Nov 1916 in Nacogdoches, Texas, and died 12 Jul 1999 in Livingston, Polk County, Texas. He married ESTELLE BAILEY11 09 Nov 1941 in Nacogdoches County, Texas. She was born 04 Jul 1922 in Nacogdoches County, Texas. Lester Lynn Sanders gave me 12 Nov 1916 as birthday of his father, Lester. i. SHIRLEY ESTELLE8 SANDERS, b. 07 Sep 1943, Harris County, Texas12; m. ROBERT L. SEYMOUR13, 09 May 1970, Harris County, Texas14; b. Abt. 193615. 8. ii. LESTER LYNN SANDERS, b. 30 Dec 1945, Houston, Harris County, Texas. 5. ANNE7 SANDERS (NETTIE ANN6 KIRKLEY, DAVID DANIEL5, ROBERT4, ROBERT KIRKLEY3 SR., JAMES2 KIRKLEY, (SR.), JOHN1) was born 08 Sep 1919 in Nacogdoches County, Texas16, and died 14 Jun 2003 in Enid, Garfield County, Oklahoma17. She married LOUIS WILFRED NUTT18 08 Apr 1942 in Ardmore, Oklahoma19. He was born 15 Sep 1918 in Ardmore, Oklahoma, and died 17 Sep 1971 in Oklahoma City, Oklahoma20. 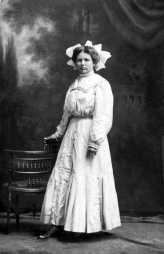 Anne's mother died in childbirth of Anne in 1919.
i. MARGARET ANNE8 NUTT, m. RON DRAKE21. ii. EVA LOUISE NUTT, m. TOM BRATTON22. iii. JIMMY NUTT, m. DIANNE. 6. JO ANN8 WOOTEN (RUTH7 SANDERS, NETTIE ANN6 KIRKLEY, DAVID DANIEL5, ROBERT4, ROBERT KIRKLEY3 SR., JAMES2 KIRKLEY, (SR.), JOHN1) was born 29 Dec 1934 in Hale, Texas23. She married (1) CLARENCE JAMES SMITH24 05 Sep 1952 in Enid, Garfield County, Oklahoma. He was born 14 Jul 1931 in Lone Wolf, Kiowa, Oklahoma, and died 18 Mar 1991 in Oklahoma. She married (2) JAMES OLIVER TURNER24 10 Jul 1961 in Ft. Stockton, Pecos County, Texas. He was born 29 Jul 1926 in Carrizo Springs, Dimmitt County, Texas, and died 30 Jun 1990 in San Angelo, Texas. ii. PAMELA JANE SMITH, m. RYAN WALKER, 31 May 1974, Howard County, Texas25; b. 1953, Howard County, Texas26. Pam and her husband, Ryan Walker, e-mailed MLK on Sunday, March 12, 2000 for info on David Daniel Kirkley, Pam's great, great grandfather. iii. COREY JOE9 TURNER, b. 05 Nov 1968, Reagan, Texas27. 7. JERALD ALLEN8 WOOTEN (RUTH7 SANDERS, NETTIE ANN6 KIRKLEY, DAVID DANIEL5, ROBERT4, ROBERT KIRKLEY3 SR., JAMES2 KIRKLEY, (SR.), JOHN1) was born 16 Mar 1938 in Hale, Texas28. He married LINDA LOU BURNS 21 Jul 1963. She was born Abt. 1940.
i. POLLIANNA9 WOOTEN30, b. 21 Dec 1963, Reagan, Texas31; m. MARK M. BEVERS32, 21 Dec 1981, Lubbock, Texas33; b. 1957. 8. LESTER LYNN8 SANDERS (LESTER7, NETTIE ANN6 KIRKLEY, DAVID DANIEL5, ROBERT4, ROBERT KIRKLEY3 SR., JAMES2 KIRKLEY, (SR.), JOHN1) was born 30 Dec 1945 in Houston, Harris County, Texas34. He married (1) CECILE MARIE BELANGER35. He married (2) SHARON MARIE CRAND36. She was born 23 Jun 1953.
i. MICHELLE M.9 SANDERS36, b. 30 Jun 1968, Caribou, Maine36; m. CARMEN SOTO36, Fairfield, California36. ii. TINA LYNN SANDERS36, b. 14 Jan 1971, Honolulu, Hawaii36; m. BRYAN HELLRIEGEL36, Fairfield, California36; b. 25 Jun 1965. 2. Nacogdoches County Marriage Records, Book F, 1889-1894, pg. 15, Indexed by Carolyn Ericson. 3. Ancestry.com, Texas Marriages 1850-1900http://search.ancestry.com...=kirkley&submitMarriage Record spells first name Zenobia, May 23, 2005. 4. Texas Marriages 1851 to 1900, Ancestry.com. 5. 1930 Carter County, Oklahoma Census, Ardmore City, Morgan Township, District 7, Image 13....Ancestry.com. 7. Sandi Williams of Madera, California (sandi@MadNet.net). 8. Descendants of John Sanders, e-mailed to Kent Kirkley, June 25, 2008. 9. Ryan and Pam Walker at rpwalker@usaonline.net. 10. Texas Birth Index 1903 - 1997, found 20 May 2009. 11. "Mary Trawick", http://www.twmccarty.com/unadoc_trawick.html (January 04, 2003). 12. Texas Birth Index 1903 - 1997. 13. Telephone call from Lester Lynn Sanders, May 20, 2009. 14. Texas Marriage Collection 1966 - 2002, found May 22, 2009. 15. Texas Marriage Collection 1966 - 2002. 16. Ryan and Pam Walker at rpwalker@usaonline.net. 17. Descendants of John Sanders, e-mailed to Kent Kirkley, June 25, 2008 by Ryan and Pam Walker. 19. "Mary Trawick", http://www.twmccarty.com/unadoc_trawick.html (January 04, 2003). 20. Descendants of John Sanders, e-mailed to Kent Kirkley, June 25, 2008 by Ryan and Pam Walker. 21. Obituary of Anne S. Nutt, Enid News and Eagle; June 17, 2003 (Oklahoma). 22. Obituary of Anne S. Nutt, Enid News and Eagle, June 17, 2003; (Oklahoma). 23. Texas Birth Index 1903 - 1997, found 20 May 2009. 24. Ryan and Pam Walker at rpwalker@usaonline.net. 25. Texas Marriage Collection 1966-2002. 26. Texas Birth Index 1903 - 1997. 27. Texas Birth Index 1903 - 1997, found 20 May 2009. 28. Letter from Ruth Sanders to Ryan and Pam Walker. 29. Texas Marriage Collection 1966 - 2002, found May 22, 2009. 30. Texas Birth Index 1903 - 1997, found 23 Nov 2008. 31. Texas Birth Index 1903 - 1997, further search; found 20 May 2009. 32. Texas Marriage Collection 1966 - 2002, found 20 May 2009. 33. Texas Marriages Collection 1966-1997, found 20 May 2009. 34. Texas Birth Index 1903 - 1997. 35. Telephone call from Lester Lynn Sanders, May 20, 2009. 36. Telephone call from Lester Lynn Sanders, May 20, 2009.